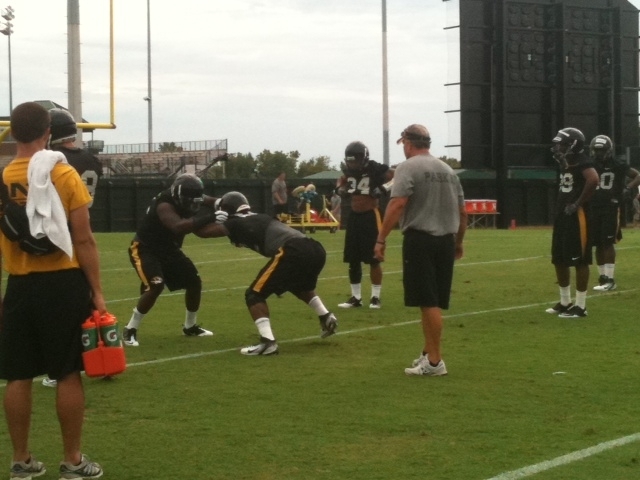 Members of the Missouri Tigers participate in Fall Camp drills. The Tigers open the season Sept. 3. The Missouri Tigers opened up fall camp on Thursday with the first of a month’s worth of practices with three scrimmages planned from now until the season’s opening kickoff against Miami-Ohio. The Tigers will be without sophomore running Marcus Murphy who will undergo season ending shoulder surgery and they are awaiting Gateway High School product Sheldon Richardson who has just a couple of more hurdles to clear from the NCAA. Head coach Gary Pinkel wouldn’t get specific on how long it would be until Richardson is back, but Pinkel said all he is waiting for is paper work from the NCAA. As far as Murphy, the Tigers certainly have depth at tailback with Kendial Lawrence, De’Vion Moore and Henry Josey returning, but Murphy was MU’s primary kickoff returner, making 24 returns for 475 yards, good for a 19.8 average. Murphy carried the ball 22 times for 181 yards. He had a big run against Texas Tech on the third play of the game, when he went 69 yards to give MU a 7-0 lead. Pinkel didn’t think it was worth the risk of trying to rehab to get Murphy on the field this season.